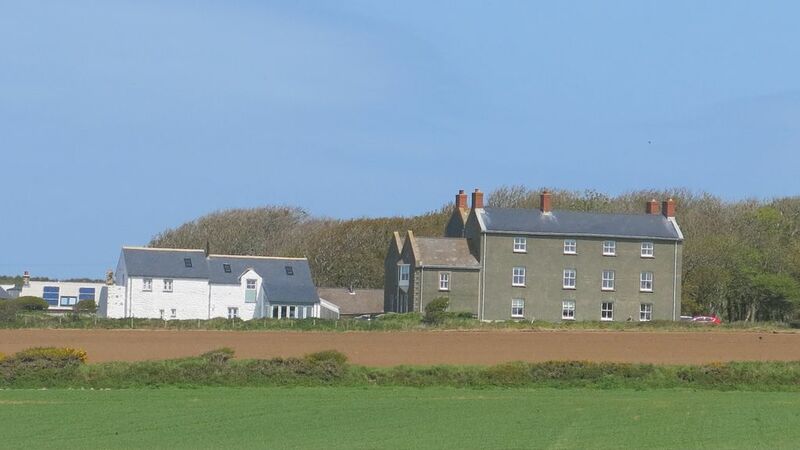 Set on the top floor of historic Llanunwas House our modern, light but cosy apartment has a stunning view directly over the wide panorama of St Brides Bay to the islands of Skomer and Skokholm. Llanunwas is a historic mansion in a country landscape; as you leave the road at Upper Solva and drive into the woods, you will appreciate you are somewhere special. Enjoy two acres of lawns and gardens with a mix of sunny and shaded areas – ideal for sitting and relaxing, or for children to explore. Nearby is Britain’s smallest city, St Davids, home of the magnificent cathedral, National Park Visitor Centre, speciality shops and restaurants. Surprisingly, in contrast to its tranquillity, St Davids is also the place to start an adventure - book fast boat trips to the islands, coasteer or kayak around the coves or learn to surf at Whitesands Bay. Skomer View sleeps 4 in one double and one twin bedroom. The bathroom has a bath with shower over, wash basin and toilet. The lounge is an ideal place to relax and look out over the sea and the islands. It is light and airy in summer and warm and cosy in winter and has a flat screen television with Freeview satellite channels, DVD player and free Wi-Fi. The kitchen diner has a full range of modern appliances, including hob, grill and oven, fridge freezer, washing machine/dryer and microwave. Attractive lawns surround the house, with plenty of space for outdoor activities. Secure storage provides a home for our deckchairs and picnic furniture, with room for cycles or fishing rods. There is parking immediately next to the house. To protect and preserve this beauty and the wildlife it supports we have the Pembrokeshire Coast National Park Authority, West Wales Trust and The National Trust. The lounge is an ideal place to relax and look out over the sea and the islands. It is light and airy in summer and warm and cosy in winter and has a flat screen television with Freeview satellite channels, dvd and Wifi. Equipment includes, electric hob, eye level grill and oven, washing machine/dryer, fridge freezer dishwasher and microwave. Notes on accommodation: Skomer View is light and airy in the summer and warm and cosy in the winter. It is on the top (second) floor of Llanunwas house. Outside: Private lawn outside shared with other residents of Llanunwas. Pets not allowed. Cleaning / Towels / Linen There is a corner shop nearby which sells fresh produce, general groceries and newspapers. Travel to St Davids for a more comprehensive range of shops including CK’s supermarket. Other: Skomer View has good mobile reception on most mobile networks. We have tested Orange and Vodafone. We have our own wifi, guests can use this at no extra cost provided usage is reasonable. Cosy, comfortable, very well equipped, with additional information provided about the local area and maps, guides etc. Views are fantastic, location is great, a lovely 40minwalk into Solva on the coastal path, bringing you in along the harbour, a lovely spot for drink and lunch or afternoon tea! Only 5 mins drive into St David's, a lovely little place, and more great walks and beaches up on that part of the coast too. A visit to Skomer island is also a must..Thanks very much...will definitely return. Thank you very much for your review. We're really pleased that you enjoyed your stay and that you were able to visit the magical island of Skomer! We hope that you have the opportunity to return soon. The apartment was very clean and well maintained and had everything we could possibly need. Ideally located for easy access to the Coastal path with spectacular views and to explore surrounding areas. Excellent value for money. Definitely recommend this place to anyone wanting to get away for some peace and quiet and glorious hikes along the coast. Thanks very much for your positive review. We're really pleased that you enjoyed your stay at Skomer View, and especially the walks along the coast path which are truly spectacular! We hope that you get the opportunity to visit again soon. Simply The Perfect Place To Get Away From It All! Our family of 4 adults went for a 4 day break to Skomer View just after (a pretty hectic) Xmas 2018. The booking process was very smooth and easy and I have to commend Phil and Jayne for their excellent and friendly communication throughout. Made us feel welcome from the start! The location (we love Solva), the apartment, the views, the costal walks were all just perfect and I would highly recommend this accommodation to anyone looking for a West Wales break. We spent New Year's Eve here, eating a lovely meal at The Cambrian Inn (gastro pub) and then visiting the Royal George which desoite being full of local families enjoying their New Year, was very welcoming and a great place to stop for a couple of drinks on our way back to pop the fizz at 12-o'clock. Just book - you'll love it! Many thanks for your very positive review. Apologies for the late response! I somehow missed it over a busy festive season. We are pleased to hear you had a good time at Skomer View. Solva and the surrounding area really are a special place to visit. We hope to be able to welcome you back sometime. A beautiful place and a stunning property. Would definitely recommend. Thank you for such a fine review. We are very pleased that you enjoyed your stay at Skomer View. We hope to be able to welcome you back at some time. We had three great days in Skomer View. The kids loved it and very well appointed etc. Would definitely recommend. Thanks very much for your kind review. We're really pleased that you enjoyed your short break at Skomer View and hope that we are able to welcome you for a longer stay when you next visit Pembrokeshire. Journey time from Cardiff : 2 hours 15 minutes. London: 4 hours 30 minutes. Birmingham: 4 hours. Nearest railway station is Haverfordwest (HVF). Take the A487 Haverfordwest to St Davids road. Pass through the coastal village of Solva and climb the hill out of town. At the top of the hill, as you leave Upper Solva, there is a 40 mph sign. Just a few yards later, there is a wooded drive to the left with a sign ‘Llanunwas’. Take the drive through the trees and keep left. All details on application to owner, any queries please ask.